The Vodno mountain is situated on the southern side of the Skopje valley. Of the side of Skopje, used to be 5 villages, Dolno Vodno (today luxury settlement of Vodno), Sredno Vodno, Gorno Vodno, Dolno Nerezi (today part settlement of Kozle in Skopje) and Gorno Nerezi while on the other side of the mountain there are more of which most known are Sopište, Matka, Gorno Sonje, Dolno Sonje and others. The highest peak on Vodno mountain is Krstovar peak, on 1,066 meters above the sea level. There is a cabin (50 beds) and also there is a barracks of the Macedonian Army. A symbol of the Christianity, The Millennium Cross was built on the Krstovar peak, in the year of 2002, marking 2000 years of Christianity. It's dimensions are 66 and 20 meters. There should be built a monastery complex in it's surroundings and a restaurant with a spectacular view of Skopje. There is a wonderful view of Skopje valley, from one side and from another wonderful view to the Jakupica mountain's highest peak, Solunska Glava (2,538 meters). There are many monuments on the Vodno mountain. At an attitude of 750-800 meters above the sea level on the eastern side of the mountain there is the town of Marko, that used be a fortress in the middle ages. 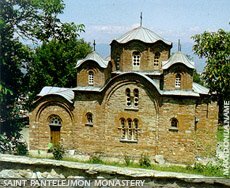 Some 10 km from Skopje, there is the St. Pantelejmon monastery, dating from the year 1164 AD. It is well-known die to the beautiful frescoes, of which the most famous "Lamentation over the body of Christ", painted 140 years before Giotto's "Pieta". In the monastery complex there is a restaurant with a wide choice of delicious Macedonian national meals, with a very pleasant interior in a traditional Macedonian national style. From the restaurant the view of Skopje is remarkable. The monastery palaces are built more recently. Today they are adapted for a modern use. 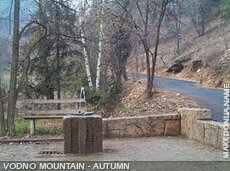 In the Sredno Vodno district (640 meters), there is a forestry cabin, a hotel "Vodno" and a wonderful park.